St. Edmund's Episcopal Church was founded in 1893 in Arcadia, Florida. The first church building was built in 1897, and it serves today as part of the parish hall. The present church building was built in 1930. 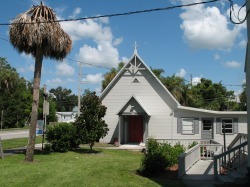 St. Edmund's Church is in the Episcopal Diocese of Southwest Florida. The Episcopal Church is part of the worldwide Anglican Communion. The Episcopal/Anglican tradition is an expression of the Christian faith that is referred to as the "Via Media" or "Middle Way". Our church is both Catholic and Reform in its theology. We maintain Catholic structure and sacramental theology tempered with Reform theology rising out of the Protestant Reformation. Classical Anglicanism references a theological base resting on Scripture, Tradition, and Reason. St. Edmund the Martyr was king of Norfolk in England from 855 AD until 870 AD. The Danes captured him as they invaded northeastern England. The price for peace and his freedom was his denial of his Christian faith. He refused, and at the age of 29 he was bound to a tree and shot with arrows. His remains were interred at the Benedictine Abbey of Bury St. Edmunds. Our rich and blessed history began in 1893 when land was purchased in Arcadia at the cost of $150 for the establishment of a mission church. The first services were held in 1895; and in 1897, with five communicant members, the original wooden structure was built. From that small beginning the Church of St. Edmund became an organized mission in 1902, which meant the congregation consisted of at least 50. The present church building was finally completed in 1930 at the cost of $8500. This money was raised by the women of the church. St. Edmund's was served by a series of priests until January 1948, when the Rev. J.M. Massie was called as vicar. Father Massie served faithfully until his retirement in 1975 and he was Vicar Emeritus until his death in 1988. Since 1975 the priests of St. Edmund's have been the Reverend Edward Manning (until 1979), Melvin Allshouse (until 1982), Raymond Dage (until 1989), Jim Bingham (until 1993), Bill Johns (until 1995), Ron Nevens (until 1998), Raymond Kress (until 2003), Greg Fry (until 2007), Jim Williamson (until 2015), and Lisa Hamilton (until 2017). The Rev. Jimmie Hunsinger served as deacon from 1996 until 1998. The Rev. Robert Vaughn has served as deacon since 2001. The Book of Common Prayer clearly states that the ministers of this Church are the ordained clergy and the laity. The people and clergy of St. Edmund's exercise their ministry in various ways in the church and in the community. The regular meeting of the Ladies’ Guild was held Tuesday, March 7th with Mrs. S. Rosin as hostess. The meeting was called to order by the president, and opened with prayer by the Rev. F.A. Shore. Roll call found twenty-one members present. Minutes of the previous meeting were read and approved. The treasurer gave a report of cash and expenditures to date. The president announced that the Easter sale would take place at the rectory, instead of with Mrs. J.G. King as previously announced. The ladies were very busy all the afternoon with their work, most of which is for this sale, which will be held on April 24th, the Monday following Easter Sunday. It was urged that the ladies of the Guild attend all the Lenten services possible. These services are held every Wednesday evening at 7:15 p.m. and every Friday afternoon at 4:30 p.m. It seems most fitting that all the members make these services a duty as well as for the instruction received through the words of the rector, Rev. F.A. Shore. Not only are the members urged to come, but all strangers will receive a most cordial welcome at all services. The visitors present were Mrs. J.A. Timberlake, who is a recent bride and who has come to Arcadia to make her home, Mrs. Salzman, and Mrs. L.I. Morgan. At the conclusion of the busy work, Mrs. Rosin, assisted by Mrs. Lock and Miss Mildred Morgan, served refreshments consisting of delicious chicken salad served with saltines, olives, preserved figs, sandwiches and punch, and these were thoroughly enjoyed by all present. After a very pleasant afternoon, the meeting was adjourned to meet Tuesday, March 21st, with Mrs. R.M. Lock, at her new home on the Brownville Road.